It’s springtime in Iqaluit! You might not know it with how cold the wind chill has been for the past week, but the biggest sign of its arrival is the annual week-long spring festival known as Toonik Tyme. The festival has been happening in Iqaluit since 1965. It is meant to welcome to coming of longer days and to usher out the bitter cold winter. Perhaps it will herald a return to a more regular blogging schedule for me us as well. 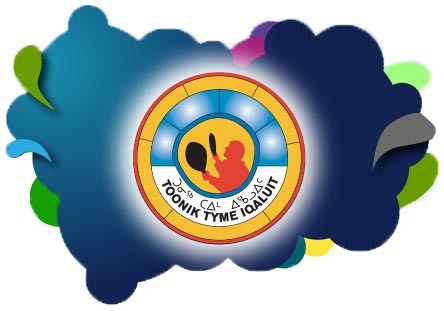 Today is the first official day of the Toonik Tyme, marked by the opening ceremonies being held at the curling rink tonight. The next seven days will be full of traditional and not-so traditional activities, including igloo building, and tea and bannock making contests, snowmobile races, dogsled races, craft shows, a country foods fair, hockey and basketball tournaments, and concerts. There will be so many things to do and see, especially for noobs like Ian and I.
We’ll also find out who the Honorary Toonik is this year. Every year, an individual is selected to preside over the event. Past Tooniks have included former Prime Minister John Diefenbaker, Prince Charles, and various Greenlandic officials. More recently however, local individuals who have made outstanding contributions to the community have received the honour. We’re hoping to get out to a lot of events, and will be volunteering at one or two as well. Hope to have lots of pictures for you all to see in the coming days! Well now. Having been on Hoth for over 24 hours now, I’ve settled in enough to finally let people in on the first tidbits of our little adventure. The day we arrived was a whirlwind of events, sights, faces and temperatures that’s hard to put into words. I’m sure once Suzanne gets a moment to breathe she’ll post a more accurate account of what exactly went down on days one & two. Rather than steal her thunder I’m just going to supply you with a photo gallery of shots (mostly by me walking around town today) of our first two days here. The image below is a link to the photobucket gallery. I didn’t feel quite like individually posting them in this entry because quite frankly I’d like to do things within the next 10 years. It’s not the complete set of images but a select few from the click-happy paparazzi photos I was taking. Thank you to everyone who supported us on the journey up especially Claudia, Dan, Uncle Mark, AC, and Wendy who had to put up with our mental breakdowns over the past month. Enjoy!